‘Saturday. I agreed to come to the park with the wife and children.’ The first line of Cold Killing might seem innocuous – but read on. Before you get beyond the first page you know that this is no ordinary husband but a cold and ruthless killer. And, though you almost certainly won’t realise it until much later, you are being set up. In the next chapter you are introduced to DI Sean Corrigan. As in many current crime novels, he has characteristics that separate him for the herd. Fortunately, in this case, he is not that somewhat clichéd maverick, a borderline psychotic whose wild, reckless actions would have him thrown out of even the most dodgy force. No. DI Sean Corrigan is different, in that the appalling abuse he suffered in childhood has given him an insight into the workings of dark minds. A darkness he recognises in himself, but which he has learnt to control, though it is a constant battle. 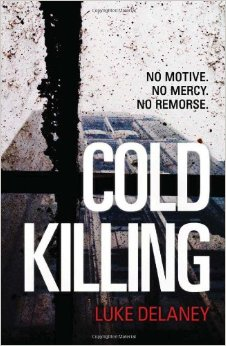 In Cold Killing he is pitched against a ruthless, intelligent and single minded killer. A killer who has detailed knowledge of forensics and who is obsessive in ensuring that he has no recognisable MO. Who deliberately chooses victims who are as disparate as they could possibly be. Despite this, Sean Corrigan is convinced that every murder was committed by the same hand. Before long he has identified the killer. And he sets out to nail him – by fair means or foul. One of the most striking things about this book, and something that sets it apart from many other police procedurals, is the inside knowledge. From the start, the narrative is shared between the killer and the cops, for the most part in the person of DI Corrigan. From the moment Corrigan identifies the killer, we too are put in the picture. From that point we are reading the killer’s narrative fully aware of who he is. There is some very clever stuff here, which I cannot reveal because of spoilers. Suffice to say there are twists and turns and several red herrings all aimed at making us look in the wrong direction. One of the most striking things about this book, and something that sets it apart from many other police procedurals, is the inside knowledge. There’s a significant difference between research and knowledge. Here the author’s experience as a serving policeman leaps from the page. Often subtle, never in-your-face, these authentic touches are some of the best parts of the book. There are some lovely touches too – a scene with magpies mourning a dead companion for example. Hence we discover what a detective typically keeps in the boot of his car. What the offices in a police station are really like – cheap wooden furniture, uncomfortable chairs, computers that are far from state of the art and harsh lighting. We learn how he or she might feel when confronted by the body of someone who was killed violently. Add to this the conversation between the officers, which are ‘warts and all’. Perhaps best of all, these officers are by no means squeaky clean. The admission that evidence gets planted and that blind eyes get turned is refreshing. Enjoyable as it is there are flaws in the writing. Not major ones and since this is a first novel they can be forgiven. In short there’s a tendency to show not tell. To take just one instance, in a conversation between the sidekick Donnelly and his wife the dialogue is very clunky. There are parts, especially in the beginning, where the adjectives are overworked. I also have a bit of a problem with the old clichés of the ‘learnt on the streets’, ‘working class lad who took up boxing to save from life of crime’ variety. Especially when linked to chunks of philosophising and ‘inner thoughts’ which ramble on and hold up the action. (In the latter case the author is in good (bad) company as Donna Tart spoils the end of The Goldfinch in a similar manner). In terms of plot, there are a few places where it is really OTT or implausible. All it really needed was a bit of tightening up, a mite more editing and a wee bit less indulgence. That’s all. There are some lovely touches too – a scene with magpies mourning a dead companion for example. Someone wearing underwear ‘to make her feel less vulnerable.’ And excellent forensic and procedural details that are lightly drawn and that are, in consequence, all the more believable. * You can see whether or not my eager anticipation was rewarded in my review of The Keeper, the second book. I posted it the wrong way round before I knew about scheduling. This entry was posted in Books, Reviews and Recommendations and tagged crime, Debut novels, Luke Delaney, Murder Squad, thrillers by Clodagh Phelan. Bookmark the permalink.